Fundraising Ideas > 20 School Fundraising Ideas to Earn You Profit! Whether you are looking for a fundraiser to raise money for a class trip, new playground equipment, or classroom supplies, here are 20 great ideas to help get you to your fundraising goal - all backed by our 100% product guarantee and highly rated customer service team. And don’t forget - fundraising isn’t just about raising money. It can be a valuable opportunity to teach kids confidence and leadership skills while inspiring them to be the change in their community. This type of fundraiser is great for when your school or group wants or needs to raise money in a short period of time. These catalog fundraisers run for 2 weeks and you can expect to see great results! Our Fall Gift Catalogs can even help your group raise $5,000 to $100,000 without having to devote tons of your time or volunteer hours. Both gift catalog fundraisers are no upfront cost, making this a great choice for any school or community. When you think of school fundraisers, one of the first that comes to mind are gifts catalog fundraisers. From wrapping paper to gourmet snacks and chocolate, our Fall Gift Catalog includes high quality items in 16 product categories with 47% of the products under $10! If you’re worried about the reputation gift catalogs have with low quality, take a look at our Cost Comparison booklet to compare our prices to your favorite retailers! We are seriously committed to bringing quality back to fundraising. Looking for a great Spring fundraiser? How about our Spring Gift Catalog! This catalog features over 40 delicious gourmet snack and chocolates plus products like flower bulbs and gifts for mom and dad. The Otis Spunkmeyer combo fundraiser is among the easiest and most popular fundraisers for a reason - food sells! Our brochure combines delicious frozen pizzas, pretzels, cookie dough, muffins and much more. When the product is delivered, it is packed per student, making the whole process seamless from beginning to end. One of our newest fundraising programs, Sweet and Savory is a creative combination of all the best-selling food items. This program features popular names brands like Otis Spunkmeyer, Auntie Anne’s, Jelly Belly, and more. You’ll get the biggest variety of food with this fundraiser combining delicious dry mixes and best-selling frozen food choices. Here at Believe, our Otis Spunkmeyer Cookie Dough fundraiser is one of our most popular (and profitable) fundraisers. Everyone loves fresh baked cookies - and the fundraiser itself is simple to run! 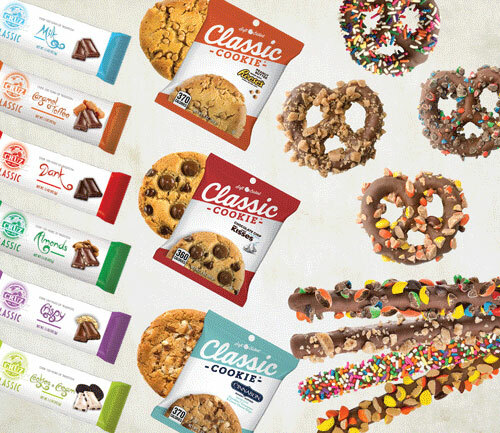 With 14 delicious cookie dough flavors to choose from, you’ll get to offer your school or group a favorite brand name while raising money for your cause. Another great benefit of cookie dough fundraisers is the fact that they are often the fundraisers with the highest profits. The Food for the Soul brochure is full of 60 sweet and savory items, handpicked to produce the best results. This brochure contains over 20 gluten free options and a convenient allergen/kosher index, guaranteeing there is something to everyone! Looking for a small brochure with a low price point? Try out our Snacking Sensation brochure. All 17 delicious treats are $10 and under! We’ve combined our best-sellers to make a low price, high profit fundraiser for groups with all needs. A new fundraiser that contains the “test of time” product - popcorn! Everything in this fundraiser is under $10, making it a win for you and your supporters. All popcorn bags are ½ gallon resealable bags and come in 10 delicious flavors. We know everyone loves popcorn, but have you had sea salt caramel or snickerdoodle cinnamon toast?! We know your sellers and customers won’t be able to wait to dig in. You can’t go wrong with the household name of Jelly Belly! This catalog contains 15 Jelly Belly items that are almost all under $10. This peanut-free, fat-free and vegetarian friendly catalog is sure to be a hit! Tag this brochure with any of our other catalog fundraisers to add a punch to your profitability! The Easter Treats brochure is packed full of confections such as Jordan Almonds, Dutch Mints, Milk Chocolate Bunnies and much more - perfect for filling those Easter baskets! These in-hand fundraising programs are great because of the low price point of the items and the fact that these delicious treats basically sell themselves! For an easy fundraiser that will bring in big profits, look no further. We are so excited to have partnered with the Cruz family to introduce a $1 chocolate bar fundraiser featuring an assortment of delicious chocolate product! This is a product in hand fundraiser and each case of chocolate contains an assortment of 60 bars - that you can customize! Build your box assortment if you’re a high participation group with great tasting chocolate bars such as Cookies and Cream, Caramel Toffee, Milk Chocolate plus more! Who can resist cookies - especially when they are only $2! Looking for an easy fundraiser that generates great profit? Look no further than our $2 Greatest Cookie fundraiser. Each carrying case contains 30 cookies with 3 delicious flavors. All of our cookies are made with natural ingredients in crimp sealed packaging so they are baked and ready to eat! Satisfy your supporters’ sweet and salty cravings with the $1 pretzel rod fundraiser. The variety pack is stocked with 60 rods in 3 delicious flavors - like our favorite, Peanut Butter Candy Crunch! The $2 pretzel twists program offers delicious chocolate dipped pretzels complete with sweet toppings. The popup display box allows the kids to showcase the 4 types of yummy, candy coated pretzel twists that are sure to be a hit. Subscription fundraisers are some of the easiest to run, as it involves no in-hand product to sell! Coupon books (both print and digital) and magazines are popular examples. Looking for an easy school fundraiser? Look no further than PushSave. This is a turn-key, easy to set-up, easy to promote fundraising strategy that just makes sense! Your supporters create their own coupon book by selecting 10 merchants they prefer from hundreds of options and then downloading the PushSave app to access them! This patented system takes coupon fundraising to a new level because your customers don’t have to purchase coupons for vendors they don’t use or don’t have access to. Customizable coupon booklets take this fundraiser to the next level. Use technology to your advantage and stress less with a no inventory fundraiser like Entertainment Digital Savings Membership! It’s like having 100s of print coupons online and on your mobile phone. All the supporter has to do is activate it on their phone or computer, and they have instant access to savings. Magazines are an ever popular fundraiser choice and for good reason - they are proven and consistent way to earn your group the profits it needs. This voucher program has $15, $20, $30, and $40 voucher options and over 100 of the most popular titles to choose from. Customers order vouchers to redeem so students don’t have to collect address information from their customers, we make it easy for them to raise money! With this magazine fundraiser, you will save up to 90% off newsstand prices on popular magazine titles - and this includes renewals as well! The brochure features over 900 print and digital offers, and your supporters can also buy online for an even larger selection and faster delivery. Our service programs can be used as a fun opportunity for the whole school or be used as a fundraiser. Whether you pick a holiday shop or a gear drive, these programs can quickly turn into a tradition the community looks forward to every year. This holiday shop is designed to help children learn how to budget their money while they shop for gifts for the whole family. 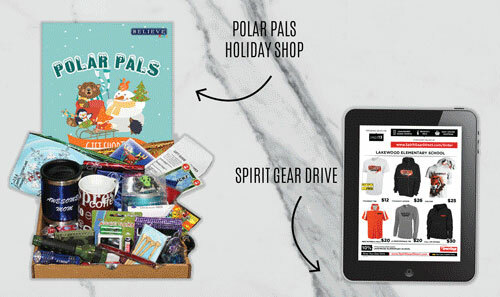 The Polar Pals Holiday Shop is easy to run with a pre-programmed cash registers and all materials included that you would need to have a successful holiday shop. Don’t worry about left-over inventory as you send anything back that you didn’t sell at no cost to you! Whether you elect to earn a profit from each item, or simply run the holiday shop for the benefit of the student’s at your school, this is a win-win for everyone! Increase school spirit this season with some new gear! How about running a 2 week Spirit Gear Drive? With no-left over inventory to worry about, free graphic design support, and you get to choose the profit percentage! Your very own Spirit Gear specialists works with you every step of the way, ensuring this fundraiser runs smoothly from start to finish. With easy online shopping, you don’t have to worry about collecting or counting money either! No matter the needs of your group, there is a fundraiser for everyone! Get in touch with us to get started. Request some more info.